Althaea is a genus of 6–12 species of perennial herbs native to Europe and western Asia. 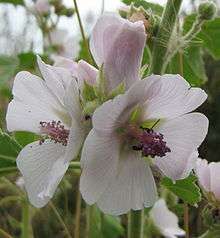 It includes Althaea officinalis, also known as the marshmallow plant, whence the fluffy confection got its name. They are found on the banks of rivers and in salt marshes, preferring moist, sandy soils. The stems grow to 1–2 m tall, and flower in mid summer. The leaves are palmately lobed with 3–7 lobes. Althaea species are used as food plants by the larvae of some Lepidoptera species including Bucculatrix quadrigemina. The genus formerly included a number of additional species now treated in the genus Alcea (Hollyhocks). The root contains starch (37%), mucilage (11%), pectin (11%), flavonoids, phenolic acids, sucrose, and asparagine. The traditional medicinal uses of the plant are reflected in the name of the genus, which comes from the Greek althainein, meaning "to heal". The Roman poet Horace refers to his own diet in his Odes, which he describes as very simple: "As for me, olives, endives, and smooth mallows provide sustenance." The root's emulsifying property is used for cleaning Persian carpets in the Middle East. It is regarded as the best method to preserve the vibrancy of vegetable dyes used in coloring the carpet's wool. ↑ "Althaea L.". Germplasm Resources Information Network. United States Department of Agriculture. 2007-03-12. Retrieved 2010-02-16. 1 2 Gualtiero Simonetti (1990). Stanley Schuler, ed. Simon & Schuster's Guide to Herbs and Spices. Simon & Schuster. ISBN 0-671-73489-X. ↑ Petkewich, Rachel (2006). "What's that stuff? Marshmallow". Chemical & Engineering News. 84 (16): 41. doi:10.1021/cen-v084n011.p041. Retrieved 2008-02-10. Medicinal Plants of the World: Chemical Constituents, Traditional and Modern Medicinal Uses by Ivan A. Ross. Wikimedia Commons has media related to Althaea officinalis.